Welcome to Torte—a small-town family bakeshop where the coffee is hot, the muffins are fresh, and the cakes are definitely to die for…It’s autumn in Ashland, Oregon—’tis the season for a spiced hot apple cider with a serving (or two) of Torte’s famous peach cobbler. It’s also the perfect time for Jules Capshaw to promote her family’s beloved bake shop by competing in The Pastry Channel’s reality show, Take the Cake. The prize is $25,000. But as Jules quickly learns, some people would kill for that kind of dough. Literally. Then, just as Jules dusts off her Bavarian Chocolate Cake recipe and cinches up her apron, the corpse of a fellow contestant is discovered—death by buttercream. What began as a fun, tasteful televised adventure has morphed into something of a true-crime detective show for Jules and everybody else on set. Who could have killed Chef Marco, and why? Can Jules sift out the killer before someone else gets burned? In ” An Oyster Shell- As with the first book it’s a fun who-done-it read in a beautiful setting that will not disappoint. The Pearls –Alexander’s clever titles just crack me up. 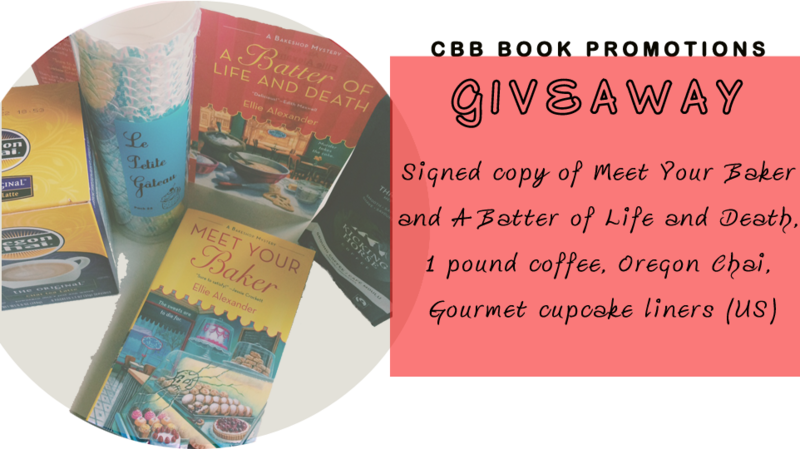 The first book was Meet Your Baker, and this book is Batter of Life and Death. The titles are just the beginning of the unbound creativity that pours from this series. As in the first book the setting is back at the Torte bakery in Ashland Oregon. It is set in my favorite time year in the NorthWest Fall. So it adds more cozy to this cozy mystery. All the characters are back and better than ever. I especially liked that we get more insight into Lance who is one of my favorite supporting characters. I liked that the main characters possible love interest gets challenged with another baker that shows up in Ashland. I liked that conflict. I loved that Jule’s mom shows more growth as she and the Professor grow in their relationship. I was pleasantly surprised at the twist of who the culprit was this time. I was half anticipating it would be the person you least suspected, therefore becoming who you most suspect; given what happened in the last book. I am glad to report that that was not the case. Alexander won major points with me for that. Jules’ husband is still estranged in this book and I hate it. It adds an unnecessary complication to the plot. I feel like this is over done. I would really like this part of the story to be wrapped up because I find it annoying. All in All I give this read a 4 pearls. I’m so glad you enjoyed it! Thank you so much for hosting a tour stop and sharing your thoughts! Of course… Thank you for introducing me to the series! It’s great!